Mr. Flower Man is an alien from a mysterious, clean and perfumed planet far far away. Mr Flower Man was sent to Earth for an important mission, that is, to clean up pollution and to reduce the odor before it reaches his planet. When Mr. 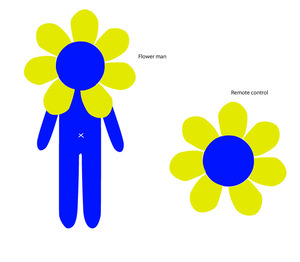 Flower Man detects odor, he immediate emits a magical spray from his belly button. The magical spray contain magical substances that kill bacteria and odor in the air. Mr. Flower Man is the terminator of odors. it's pillow talk anyway...they understand each other. Concept: CK and I are creating a pair of plush bunny rabbits who are married. They are very protective over one another, so when you grab either bunny by the ears, the other becomes furious. General tasks/responsibilities: I will handle the bulk of the physical computing side including creation of the circuit which will include the basic stamp, voice record/playback IC chip, and wireless communication chips. CK will handle the bulk of the plush design, fabric patterns, and toy construction. We'll be helping each other out with most of the process. Time table/schedule: By Nov 29th, we'll have the audio ICs and parts for circuit construction. We will also have one of the plush toys created (without stuffing). By Dec 6th, we will have the circuits close to completion as well as both plush toys. By Dec 13th, the circuits will be encased and placed inside the stuffed plush toys. By Dec 20th, we will correct any circuit issues and/or cosmetic problems with the toys. Form a group if you want, don't form a group if you don't want, just make sure you have some concepts ready.